As one might expect for New Jersey’s fastest growing private employer, Freedom Mortgage of Mount Laurel is feeling some growing pains. One of the biggest challenges facing the young company, which has more than doubled the size of its workforce over the past three years, is good verbal communication between employees and customers and between managers and their employees. 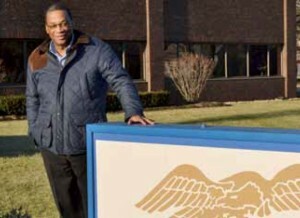 Freedom Mortgage HR manager Andrew Boney stands outside the company’s Moorestown office at 301 Harper Drive. Freedom Mortgage won the accolade of fastest growing employer from the Inc. 5000’s annual “Hire Power” ranking of private companies. CEO Stanley Middleman has deemed communications training to be essential for his young company. For help, he has turned to the Corporate Training program at Burlington County College (BCC). Andrew Boney, a senior recruiter and HR generalist with Freedom Mortgage, stands at the center of the company’s management training efforts in Moorestown. He’s been in the business long enough to know that good communication skills, essential to business success, are difficult to acquire. He says training is essential. An important lesson: managers must listen carefully to what they are saying and how it might be interpreted by others. Altogether, more than 188 Freedom Mortgage employees, from loan processors to executives, have received training from BCC in a variety of communications skills pertinent to their jobs. BCC’s work with Freedom Mortgage and other area companies is part of the state’s Basic Skills Workforce Training Program. The program offers classes in computer operations, math and measurement, verbal and written communications, English as a second language, and Spanish in the workplace. and Workforce Development (LWD), which is a partner in the program with the NJ Community College Consortium for Workforce and Economic Development and the New Jersey Business & Industry Association. This story was originally published in the February 2014 issue of New Jersey Business, the magazine of the New Jersey Business & Industry Association. The author is Christopher Biddle, President of Biddle Communications & Public Relations.